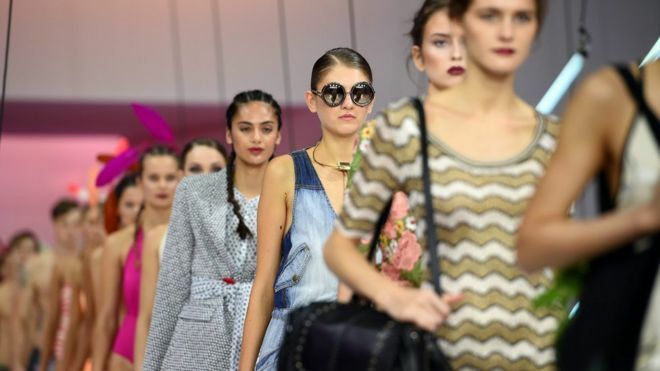 Designers at London Fashion Week should show at least two sample sizes, one of which should be a UK size 12 or above, the Women's Equality Party has said. Its #NoSizeFitsAll campaign has called on the British Fashion Council to lead the way for healthy body images at the event, which starts on 15 September. The WEP said: "Designers churn out sample sizes so small that models have to starve themselves to fit into them." The BFC said it takes the issues the campaign raises "very seriously". A UK size 12 or above is considered "plus-size" by the industry, while sample size clothing worn by models on catwalks tends to be a UK size 4, or a US size zero. Ms Walker said 28 studies from the UK, Europe, North America and Australia had found that images in the media of models had a direct impact on how women viewed their bodies, with negative body image putting someone at a considerably heightened risk of developing an eating disorder. The campaign is also calling for body image education to be mandatory in schools, for a change in the law to ensure models are of a healthy weight and for magazines to include one plus-sized spread in every issue. With less than a fortnight to go until the opening of London Fashion Week, Ms Walker said the British Fashion Council (BFC) "has got to raise their game".